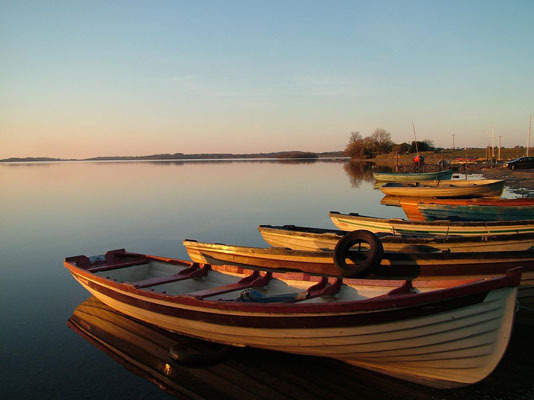 Lough Ennell is a lake near the town of Mullingar, County Westmeath, Ireland. It is situated beside the N52 road, off the Mullingar/Kilbeggan road. It is approximately 4.5 mi (7.2 km) long by 2 mi (3.2 km) wide, with an area of about 3,540 acres (14.3 km2). It has a huge area of shallow water with nearly two-thirds of its area being less than 25 feet (8 m) and almost half of it being under 10 ft (3.0 m) deep. Lough Ennell produced Ireland’s largest ever lake brown trout at 26 lbs (11.8 kg). Lough Ennell is dotted with islands, many of which have now become attached to the shoreline as the levels of the lake have changed. The main river flowing into Lough Ennell is the River Brosna, which enters on the Mullingar side of the lake and exits on the opposite side at Lilliput. Lilliput and Lilliput House were frequently used by Jonathan Swift as a holiday home and place to write, local tradition states that Jonathan Swift was in a boat on the lake when he looked back at Lilliput and noticed how small the people looked at that distance, hence the inspiration for his most famous book Gulliver’s Travels. Lilliput at the time was called “Nure” however after the publication of Gulliver’s Travels locals began to refer to the lakeshore as Lilliput, the name stuck and today the area is known as Lilliput.